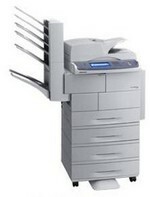 In May, we told you about a new A4 B&W MFP in Samsung range : it's done! The Korean firm launched its 43 ppm SCX-6545. This machine replaces the SCX-6345. Some differences between the 2 models : the DADF can receive 100 sheets against 50 formerly, its new high capacity tray offers a better autonomy for users. Please note that the SCX-6545 owns in option 4 mailboxes. Indeed you can obtain up to 6 output on this model.